It has always been the practice of the Church to take special care of those who are sick. We see the suffering Christ in them, and desire to take them his consolation. If you are, or know of, a sick parishioner, please let us know, and we will do our best to support them in the most appropriate way. Those who are housebound can be taken Holy Communion either by one of the clergy or a lay Extraordinary Minister. In this way they can share in our common celebration of the Eucharist and be nourish by Christ’s body. 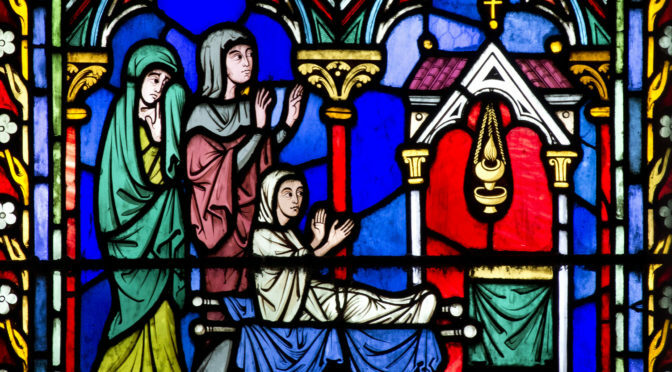 Those who are have begun to be seriously ill or frail should receive the sacrament of Anointing of the Sick, where Christ gives them forgiveness of their sins and the strength to bear their illness. Anointing shouldn’t be put off till the last moment. We are happy too simply to visit and pray with and for those who are sick; and to celebrate the Sacrament of Penance (Confession) as needed. When somebody is nearing the end of their life, there are special prayers and rites, in particular the celebration of the Holy Communion as Viaticum, food for the journey, and the granting of the Apostolic Pardon. Please don’t delay getting in touch if death seems to be approaching. In urgent cases it’s probably best to get in touch with us by telephone (0191 384 3442). All the local hospitals have a Catholic Chaplain. It’s important to let the staff know at time of admission that you are a Catholic and would like the Catholic Chaplain to come to see you while you’re there. Messages for the Catholic Chaplain to the University Hospital of North Durham can be left on 0191 526 5131.